The statement tickled my father so much that he adopted the phrase (without the “Dad”) and used it often for the rest of his life. In later years, the expression shortened to “speak to me,” and to this day when I hear those words I also hear my father’s voice in my head. In writing, “voice” refers to the resonance and ring of an author’s words, the way the sentences rise and fall with distinctive rhythm and pace. Voice makes writing unique to the author-creator, and although a strong story and sterling grammatical skills are necessary elements of writing, it is ultimately the author’s voice that transforms a reader into a fan. Many novice authors struggle with voice. They want to sound like Twain or Dickens or to create mysteries that echo P.D. James. They write fantasy novels filled with “thees” and “thous” because they think high language gives their words the ring of Tolkien’s prose. Imitating other voices can help an author learn different styles, but imitation is really only a training exercise. It is not a method of finding the writer’s voice. The key to developing writing voice is remembering that your writing should sound like you. Every author’s words have an individual style and rhythm and pace, a voice that comes from within the work, unique to that writer alone. Finding it isn’t always easy, but any writer willing to work can find and develop the special voice that is his or her very own. Authors, like singers, don’t develop their special voices overnight. Finding and training your voice requires work and practice, but everyone can do it. 1. Read often and widely. Your own work may focus on one or two genres, but good writers read a variety of creative works, many very different from their own. Take me for example. I write mystery novels for publication, but my current reading list includes two works of non-fiction, a thriller, a young adult novel, a work of historical fiction set in France, and a pair of biographies. Varying your reading list will help you learn to “hear” the voices in other authors’ works, which in turn will help you distinguish your own writing voice. When you read a passage that moves you, stop and read it again. Ask yourself what the author did to achieve that effect. Study the way the author arranged the words. Rearrange the words in your mind. What effect do your changes have on the rhythm and flow of the passage? Have you made the voice better or worse? The exercise also works with passages that don’t resonate in your ears. Ask yourself why the words didn’t hold you. Re-imagine the words in your mind. Can you find a way to make the idea flow? If you choose to perform this exercise on paper, the results should be kept for personal use and not published or posted online. Rearranging another author’s words without permission is plagiarism and copyright infringement if you publish the changes or reproduce them on your blog without proper attribution and explanation. Even then, you may violate copyright if you use (or paraphrase) too much of the original work. This exercise is intended for personal use only—to help you learn to recognize other authors’ voices and to assist you in developing your own. 2. Write as often as possible. 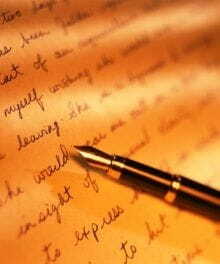 Try to write something every day, even if you have only ten minutes to spend. A writer’s voice, like a singer’s tone or a dancer’s style, emerges through hours of practice and repetition. Some authors discover their voices fairly quickly, but in many cases the writer’s true voice emerges after years of practice and hundreds of thousands of words. That may sound daunting, but you only have to write one word at a time. Sooner or later, even little strings of words can cultivate a writing voice. 3. Read your writing aloud. The best way to hear your own writing voice is to read your work aloud. You can read for others if you wish, but no audience is required. Successful authors use this technique with every story and every manuscript. Reading aloud helps you recognize the rhythms that make your writing special. It also highlights grammatical errors and awkwardness in your work. 4. Never give up. The difference between an established writing voice and an underdeveloped writer struggling to find one is largely a matter of work and perseverance. If you’re having trouble finding your voice, take a break to focus on other writing skills like grammar and plot. Voice complements style, and often emerges only after the author has mastered more elementary principles. Learn the basics, and voice will follow. Ultimately, your writing voice is what makes your work unique. Once you find it, cultivate it through practice and repetition. Your voice will grow and develop alongside your other writing skills, until eventually it seems as familiar as your reflection and as natural as breathing. Susan Spann is a partner in the law firm Llewellyn Spann, where she specializes in copyright, trademark, and corporate law. Formerly a professor at Trinity Law School in Santa Ana, California, she currently teaches business law at William Jessup University. Copyright 2012, used with permission. All rights reserved by author. Originally appeared in the June 2012 issue of The Old Schoolhouse® Magazine, the family education magazine. Read the magazine free at www.TOSMagazine.com or read it on the go and download the free apps at www.TOSApps.com to read the magazine on your mobile devices.